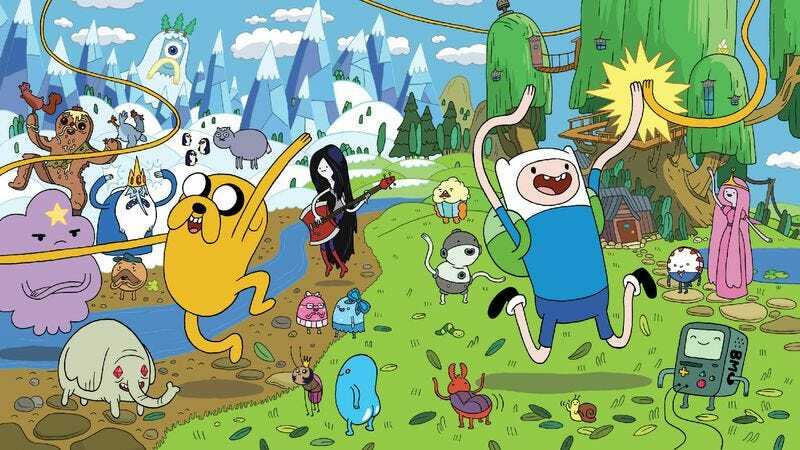 After 100 episodes, you can't tell Adventure Time what to do anymore! Here’s what’s up in the world of TV for Monday, October 1. All times are Eastern. Adventure Time (Cartoon Network, 7:30 p.m.): Now, we have trouble actually thinking of this as the 100th episode of the show, since these things are produced in pairs that make up one “episode,” that’s then split across two weeks. We’re also a little confused, since tonight’s installment is actually the 101st installment produced. But, hey. Cartoon Network is calling this the 100th episode, so we’re going to celebrate the 100th episode, while Oliver Sava tries to convince everybody else that this is totally fine for our 100 Episodes feature. Do not displease him! Alphas (Syfy, 8 p.m.): After last week’s not-so-shocking character death, Alphas looks ready to spend a week grieving the dead, while probably finding time to solve an Alphas-related case or two. Todd VanDerWerff can’t wait to see David Strathairn bring his best crying face to the proceedings. How I Met Your Mother (CBS, 8 p.m.): You thought Barney wasn’t going to have an elaborate pre-nup for his upcoming marriage to Quinn? Well, think again! We’re guessing that the agreement will eventually be published as a tie-in book. Donna Bowman would love a Bro Pre-Nup Code for purchase. Regular Show (Cartoon Network, 8 p.m.): That’s right. We’re adding this show. What of it? Alasdair Wilkins is excited for the season premiére, but he’s curious how everybody’s going to handle being brainwashed. Meanwhile, we at What’s On Tonight are still trying to figure out the bird thing’s name. Switched At Birth (ABC Family, 8 p.m.): “Bay and Zarra try to find out who’s ruining their street art” in yet another example of this show’s stunning ability to break out super-exciting plotlines that will get all the kids buzzing. Carrie Raisler hopes the person ruining the street art isn’t too critical, ha ha. 2 Broke Girls (CBS, 9 p.m.): You guys were all skeptical that Pilot Viruet’s name is actually Pilot Viruet, but c’mon! We employ people named Todd VanDerWerff, Myles McNutt, and Noel Murray! That’s the least weird of those names. Tonight, Pilot watches as the broke girls await Martha Stewart’s call. Castle (ABC, 10 p.m.): Castle and Beckett have embarked on a secret relationship, because secret relationship storylines have always been the best things about any given season of any given show you want to name. Phil Dyess-Nugent will spot you Friends, but can you name one other good example? Revolution (NBC, 10 p.m.): Les Chappell thought last week’s episode wasn’t half bad, at least not until the series got back to its strained mythology and stuff. Les has only two demands for the weeks to come: 1.) fewer back-story moments and 2.) a sword-fighting monkey. That would be awesome! The Inbetweeners (MTV, 10:30 p.m.): The guys head to an RV Resort, and Margaret Eby decided to get the full experience, she’d rent her own RV and wander the American Northwest. She’ll be filing this report from Couer d’Alene, Idaho, where she’s enjoying the best pancakes she’s had in her life. The West Wing (11 a.m.): In the episode “Privateers,” viewers check out a single day in the West Wing. Steve Heisler’s excited to see what happens, but he’s also sort of upset that nobody plays the Wing Commander spinoff game Privateer, because that game was awesome. Bring back Chris Roberts! Justice League (1 p.m.): What’s On Tonight’s only experience with Vandal Savage is in the awesome New 52 title Demon Knights, so we were surprised to learn that he’s apparently a villain or something? If we just hung out with Oliver Sava more often, he could fill us in on what, exactly, that guy’s been up to. iHeartRadio Music Festival (The CW, 8 p.m.): The CW scoffs at all of the other networks, starting their seasons over the last few weeks. It didn’t see the need to start the season the first half of October. The CW laughs at your need to make the TV season match the farming calendar, puny other networks! Half The Sky: Turning Oppression Into Opportunity For Women Worldwide (PBS, 9 p.m.): You know what oppressed women around the world could use? The help of some of America’s finest celebrities! Brandon Nowalk reviews this two-part documentary based on the acclaimed nonfiction book. Nickmom Night Out/MFF: Mom Friends Forever (Nick Jr., 10 p.m.): Every night after the kids go to bed, Nick Jr. turns into Nickmom, the wildest channel on the TV! The press copy for the channel describes it as “motherfunny,” and the descriptions of every program sound wildly desperate! Just like your mom! Don’t Sleep (BET, 11 p.m.): BET enters the crowded late night talk show landscape by trying something different, as journalist T.J. Holmes hosts a freewheeling discussion about politics, pop culture, and other stuff. We’ll check in for the show’s debut week and hope it’s really as different as it sounds. Night Of The Living Dead (IFC, 8 p.m.): Hey, is it October? Is that the smell of burning leaves in the air? Does everything we eat now come flavored like a pumpkin? Are zombies on every network on television? We sure hope so, because we like having nightly horror classics like this one on to watch. No Way Out (Reelz, 8 p.m.): If you’ve got a hankering for some Kevin Costner in a twist-laden thriller, well, you’ve come to the right place. If you like that sort of thing and haven’t ever seen this ‘80s flick, then you’re missing out on something that’s a heck of a lot of fun. What else are you going to do? Monday Night Football: Bears at Cowboys (ESPN, 8:30 p.m.): If the Bears somehow win this one, then they’ll be tied for first place in the NFC North with the Vikings, which is not exactly what we were expecting when this season started. We can only assume it’s good karma for Chris Kluwe. Dexter (Sunday): Joshua Alston doesn’t blame you if you gave up on this show in the fourth or fifth or especially the sixth season. He knows it got pretty bad there for a while. But he does want you to know that the seventh season premiére is one of the best episodes of the show in quite a while. Take a look!